Rather than going with the popular colors of the Christmas holiday season – red and green – my new ‘nice’ outfit for this year’s end is going with the basics of black and white, skirt and top. This way it is really an all-year-round fancy outfit with many styling options…each time I wear the skirt and blouse (especially the blouse) I can look slightly different! Both of the patterns I used are not “new” anymore, being from 2012. This fact combined with the fact that nobody, except for one skirt, had posted a completed version had me quite apprehensive. However, I think I have found a way to make the best of these patterns by going with the basics to bring out their amazing styling. 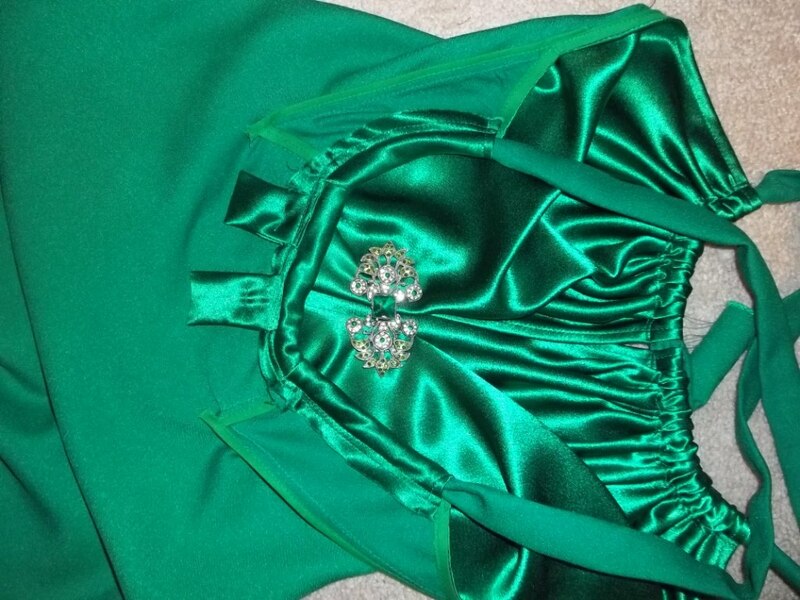 After some difficulty with fitting the skirt, I am extremely happy with my finished pieces. 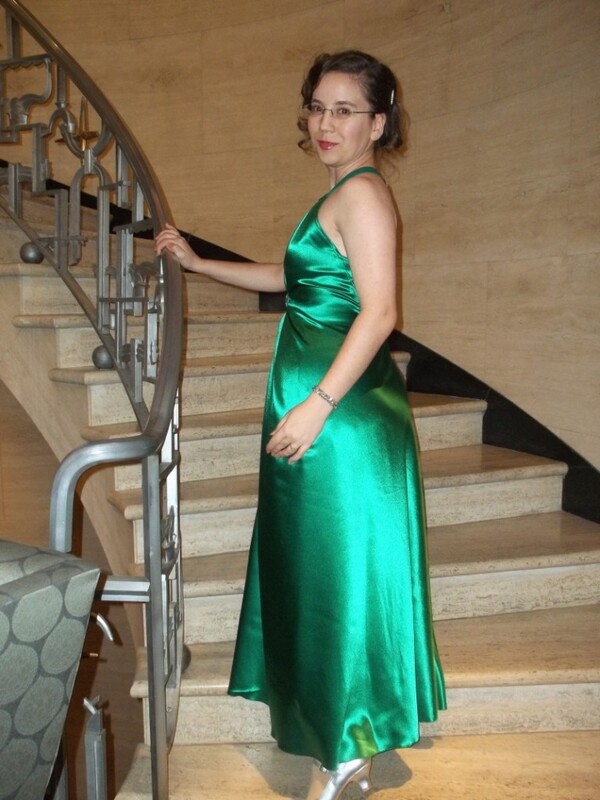 FABRIC: For the skirt: Two yards of a basic satin, with a low-shine and slightly crisp but still supple ‘hand’. It is 100% polyester. For the blouse: One yard of a white chiffon, which has a small, low-key pattern woven in as part of the fabric. It feels like it could be a rayon, but my guess is it is probably polyester. 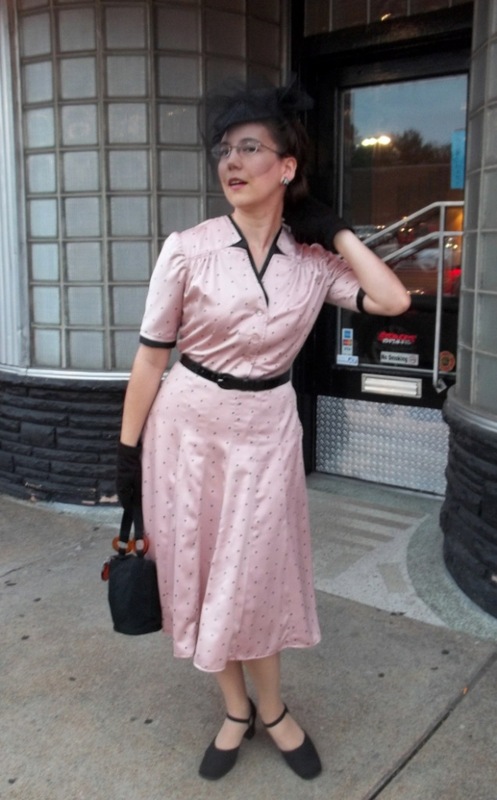 NOTIONS: I had everything I needed on hand – thread, bias tape, a zipper, a button, a waistband hook-and-eye, interfacing, a small cut of elastic, and stay tape. TIME TO COMPLETE: About 4 or 5 hours were spent to make each project. 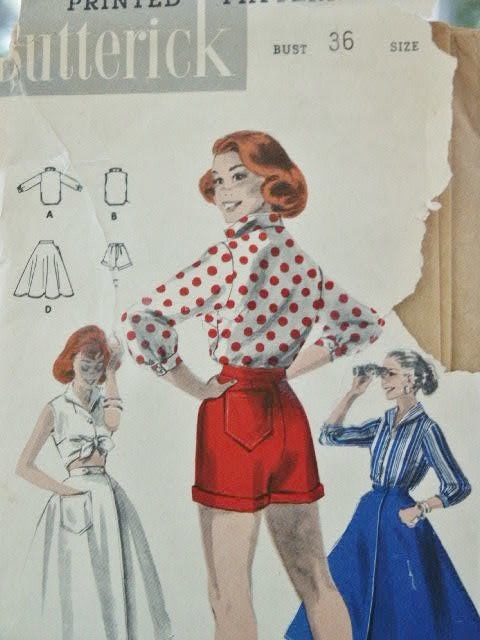 THE INSIDES: The blouse is all French seams, needed because of the material, and the skirt has bias bound edges, with the back panel self-fabric covered by a facing. 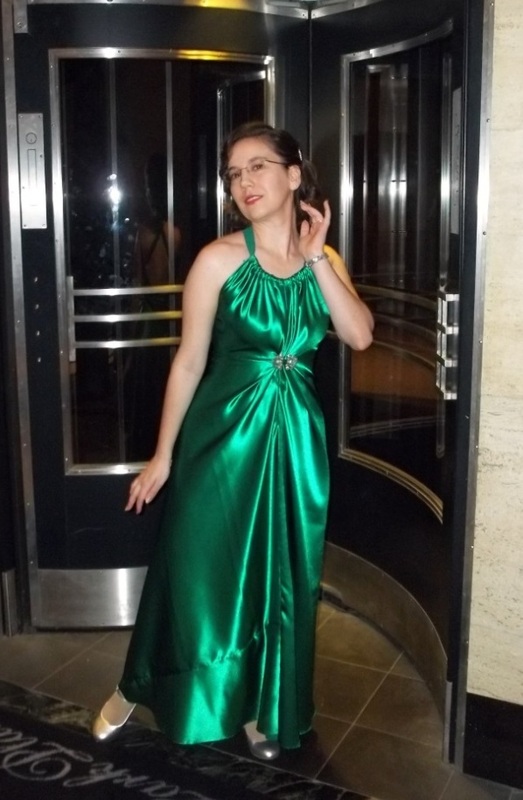 TOTAL COST: The satin for the skirt was probably about $10 to $12, while the white chiffon is something I have had on hand in my stash for about 10 years…so I’m counting it as free at this point. 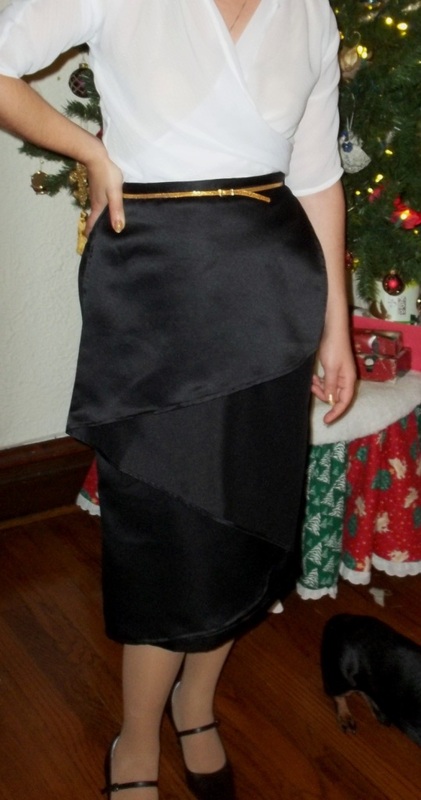 Out of the two garments here, what is the neatest part about the skirt in particular is that it came from the very first Burda magazine I bought. 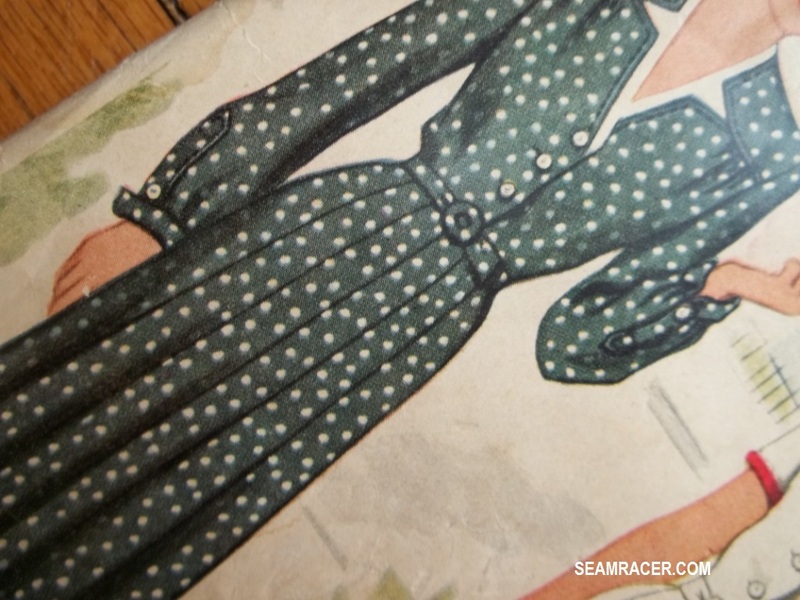 It was also one of the very first patterns from the magazine that I gravitated towards. Now I’ve finally made it in reality, not just in my mind’s eye! I will admit, I was not enthused by the way the model’s skirt is made from stripes in such a busy print. The design is lost. Personally, I like my solid satin version sooo much better. 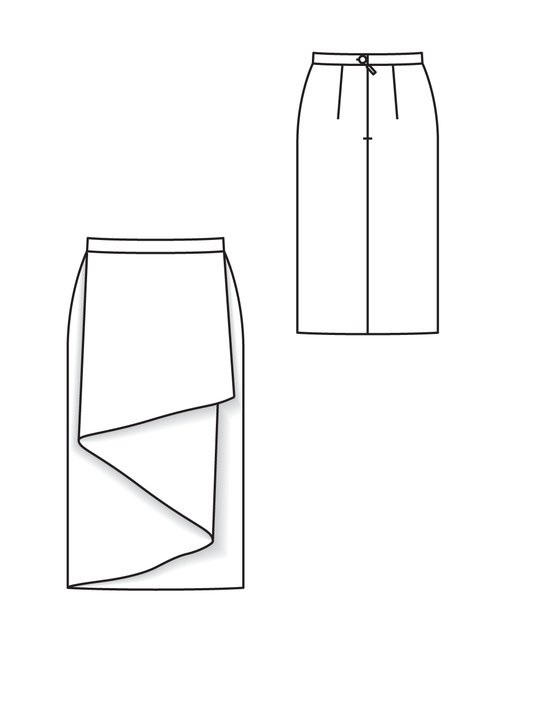 Once I found the right fabric for the skirt and had a reason to wear it, I was so excited to make it so I made a shortcut to get it done quicker – used it directly from the assembled PDF paper version. I avoided the tracing out from the page insert in the magazine. 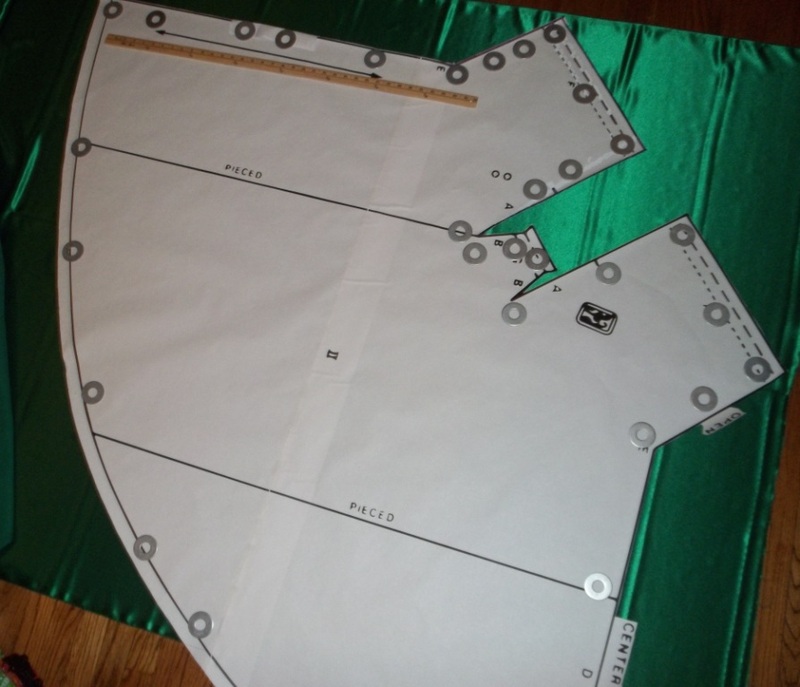 Once all the papers were assembled together, I merely cut it out with all the sizes and cut out what size I wanted. Ooops! In my rush I forgot to add on the seam allowance. I really do and should have known better. 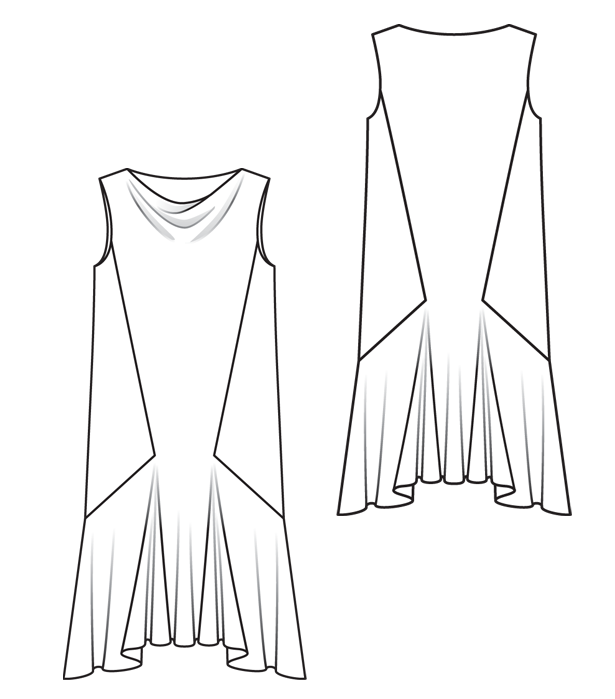 Well, I have had a few failures with Burda skirts not fitting my hips before this, so I actually cut out a size bigger than normal for this draped front skirt. This size bigger actually gave me 3/8 seam allowance to sew my skirt into a finished size down from what I intended to make. 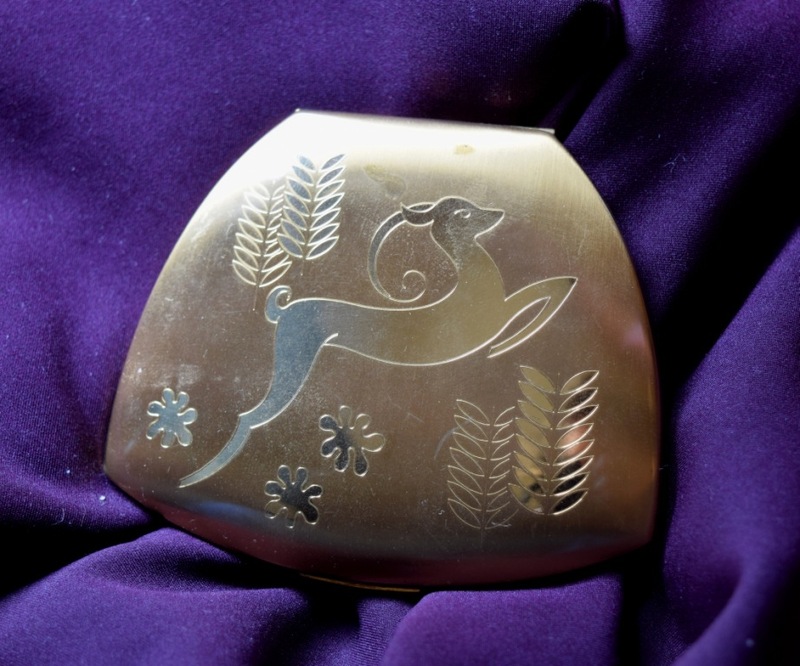 I had to look at my mistake from a practical level and did not want nor did I see the need to scrap my project, but I was back to making the size I did not want, one which normally does not fit me. I figured I would make it as is and see what needs to be fixed from there. 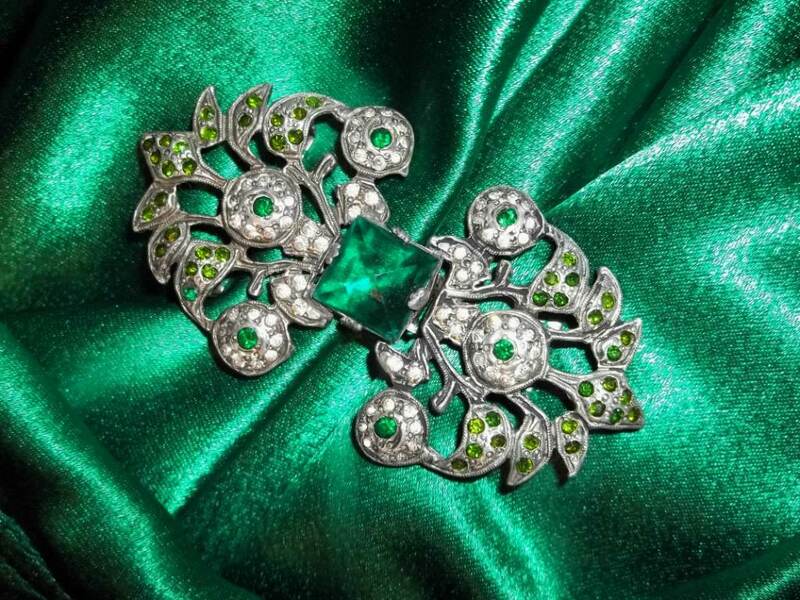 Many times my best ideas which make a garment actually turn out better stem from a mistake. This skirt is no exception. Despite my confusion with the seam allowance and the sizing, when I was cutting out the pattern I did think, “This seems to have very straight lines…” and honestly I think that is the main problem with this skirt. 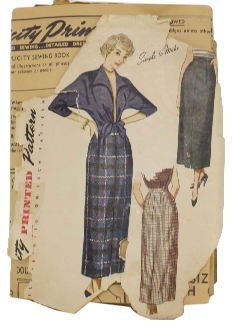 It is not shapely at all – it reminds me of the 1930’s patterns I’ve made where they are made for beanpole women, with no account for a booty or chunky thighs. If you’re quite skinny this pattern’s shaping will not be a problem, otherwise it will be one unless you reshape it like it did. 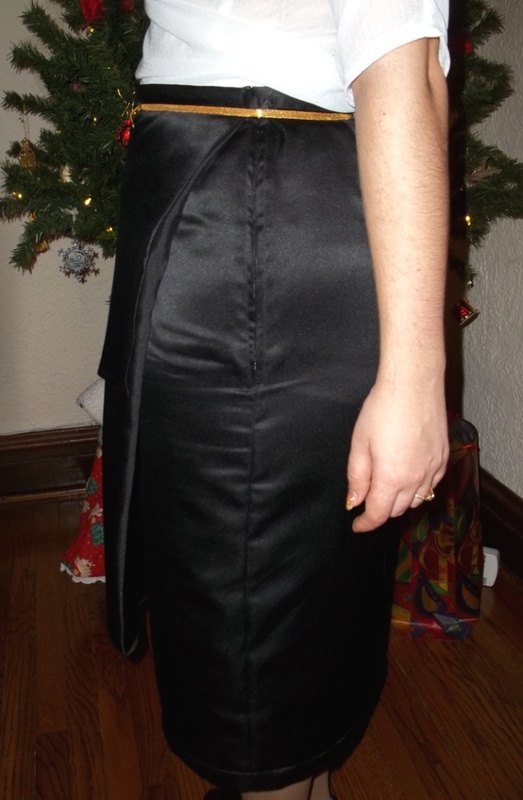 As the original finished skirt turned out way too tight from the hips and below, but big in the waist, I opened up the back seam to let it open naturally to find out how much extra room was needed. 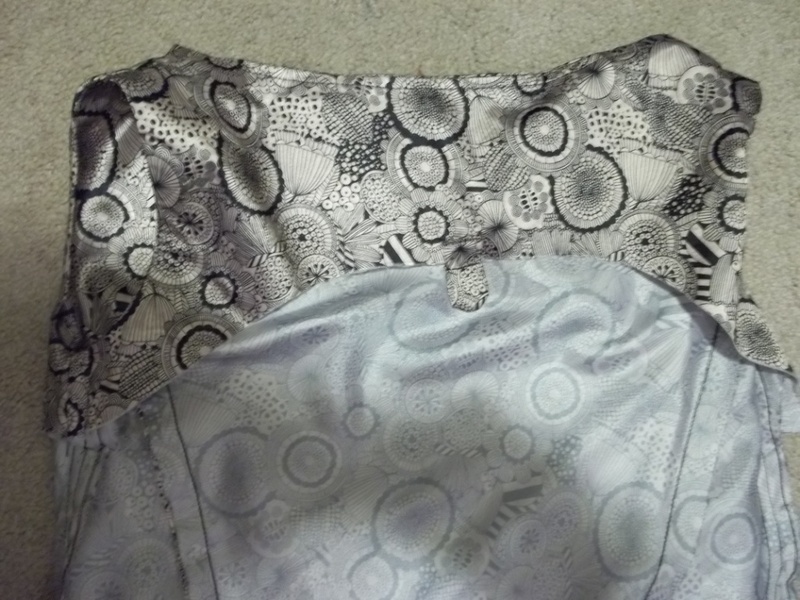 As it turned out, I added in a center panel running vertically down the back skirt which gave me an added 1 ½ inches. Before I added that panel, I did cut a curve into the waist of about ¾ in smaller, shaping the back so much better. Not only does my skirt now fit better (well it’s still slightly big…) but I like the added interest and complimentary line of the added panel. 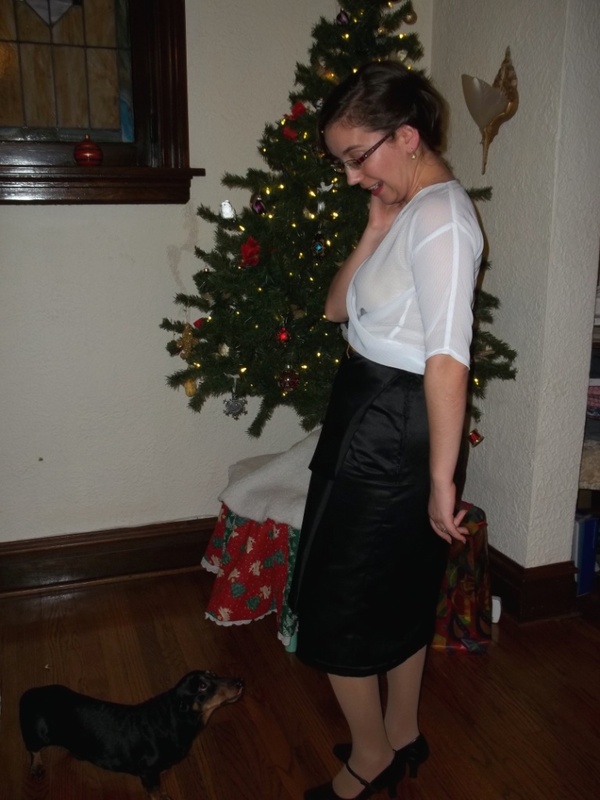 It also gives me a tad more walking room in what is already a quite limiting hem – no high kicks or wide strides in this skirt! With all these adjustments, I did also make a number of changes to the pattern. 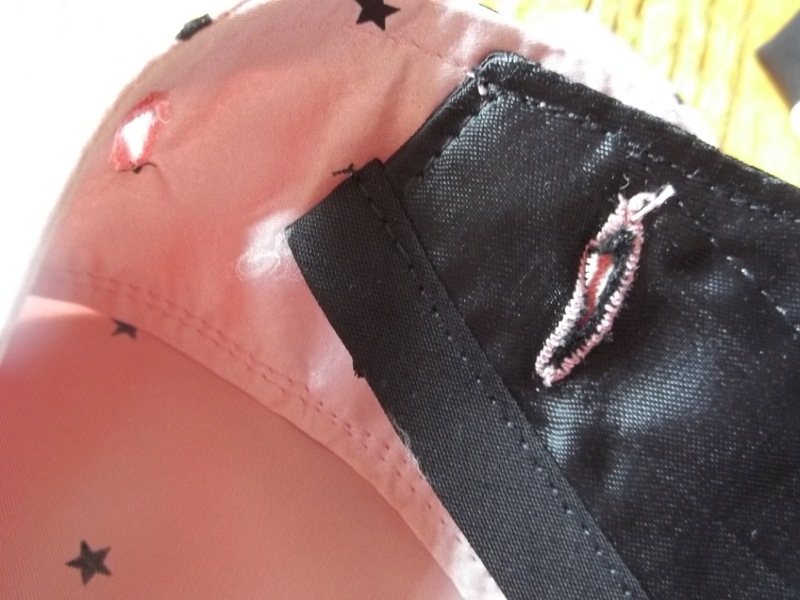 First of all, because of the back extension panel, the zipper is in the side seam. 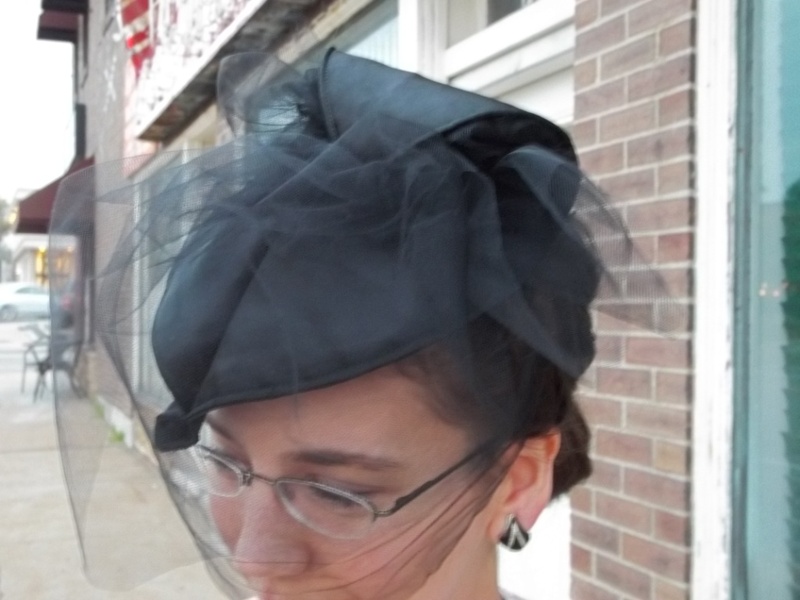 Secondly the front drape is single layered rather than double layered as a self-facing like the pattern directs. 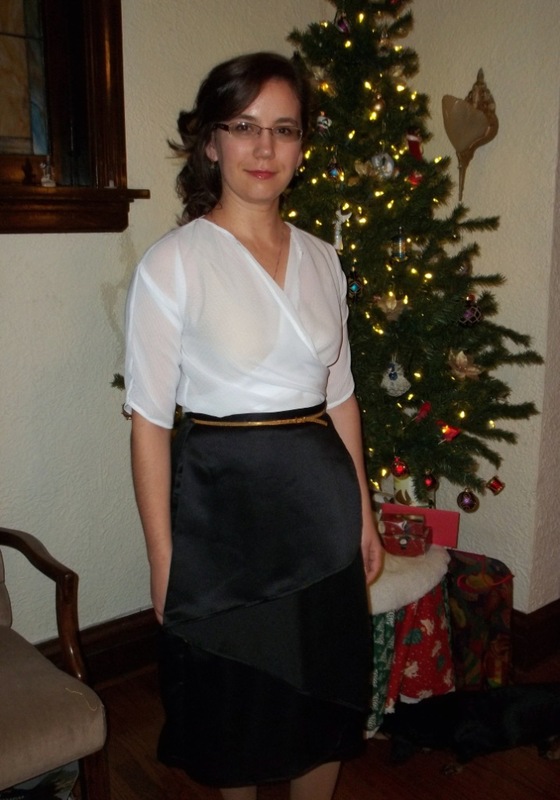 Two layers for the front drape strikes me as heavy, time-consuming (not always a bad thing), and overwhelming to the simple skirt underneath. 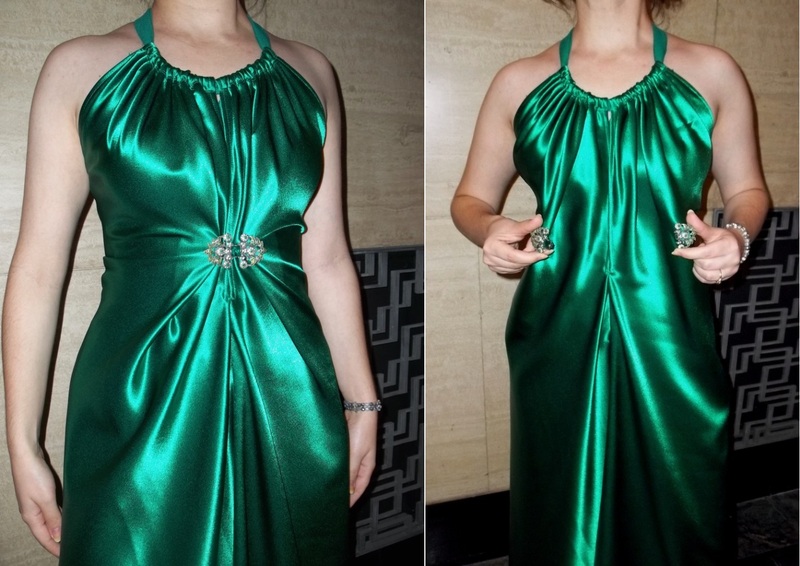 Perhaps, with a rayon or polyester fabric the double layered drape might work well, but I wanted simplicity here, and I knew the satin would not hang naturally doubled up, so I went with a single layer with a skinny ¼ inch hem. 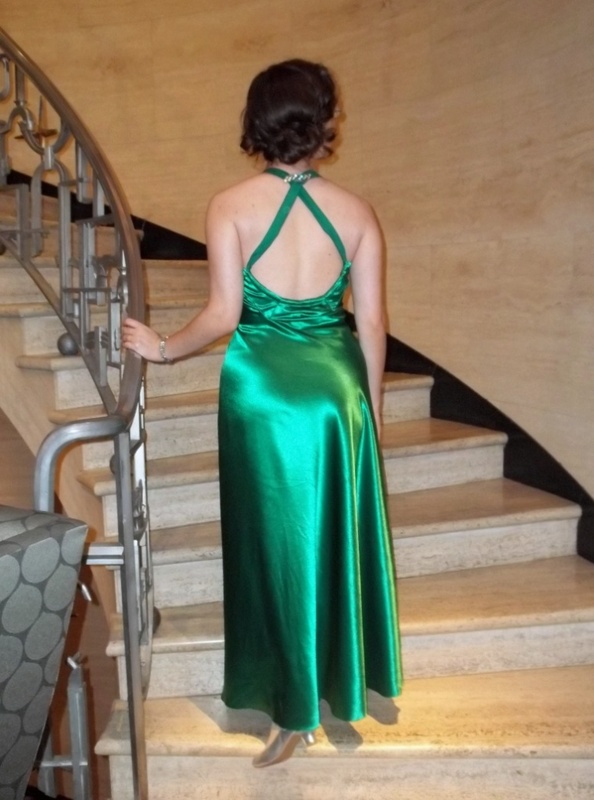 Yes, the wrong side of the satin and the hem shows in the middle of the drape, but I don’t think either appears bad or out of place or even that noticeable. 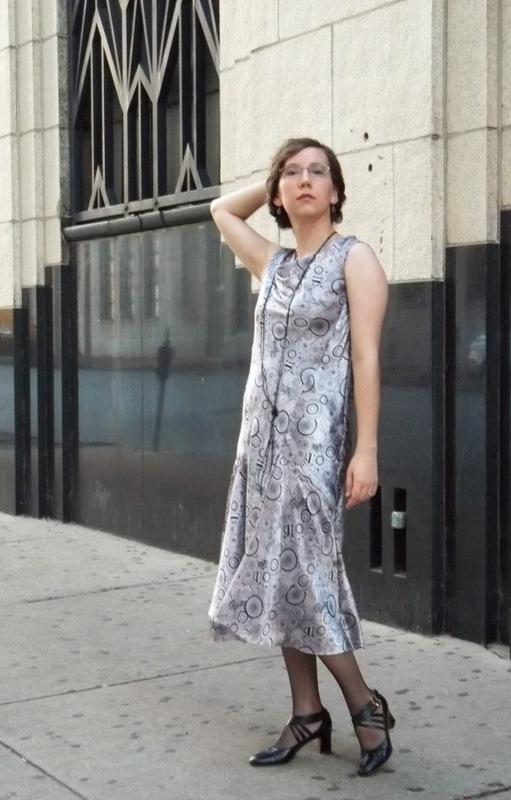 A natural hanging drape is most important to the proper look, and boy do I like the look! Any way I see it, I like how slimming the silhouette is and how interestingly the drape grows out from the front somehow. The drape is also perfect for hiding a tummy that is happily filled with all the delectable goodness which parties and the holidays have to offer. The skirt does fall at natural to high waistline making it perfect to go with the short and simple wrap blouse. 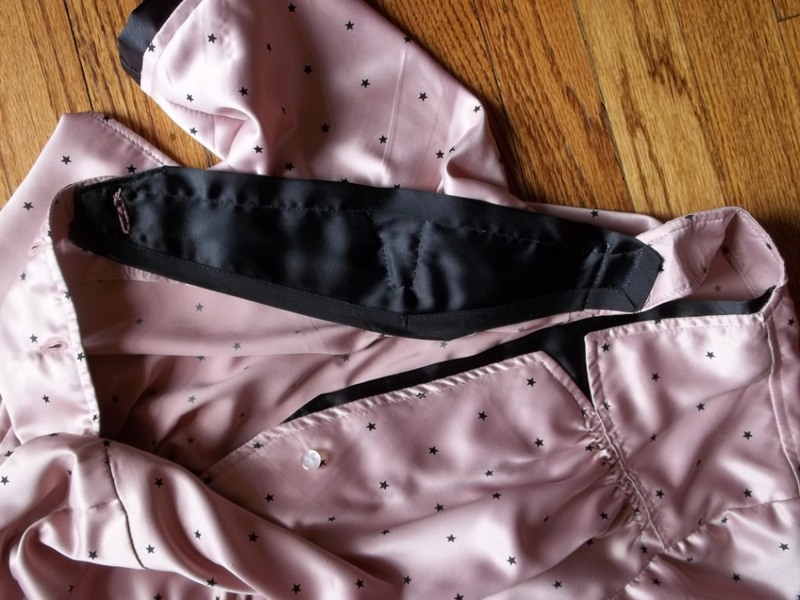 The blouse was very easy to make and draft (yes draft, you don’t get a pattern but a guide to draw it yourself), but the French seams and the light fabric to get the hang and fit right slows down the construction. Drafting it myself was the best part of this blouse – it makes it feel like it’s more “mine” and is a good practice in pattern drawing. I use thin but sturdy medical paper to draw my patterns…it the best stuff ever for this kind of work. The medical paper is very reasonably priced and is sold in large amounts on a roll, like wrapping paper, and as easy to write on as it is to see through. I stuck with my traditional size which I make with Burda patterns but I wish now I had actually went up a size for the back panel. It’s not a big deal to me be just a little snug for extreme stretching to put those ornaments at the top of the tree or hide that present for someone else at a high shelf. 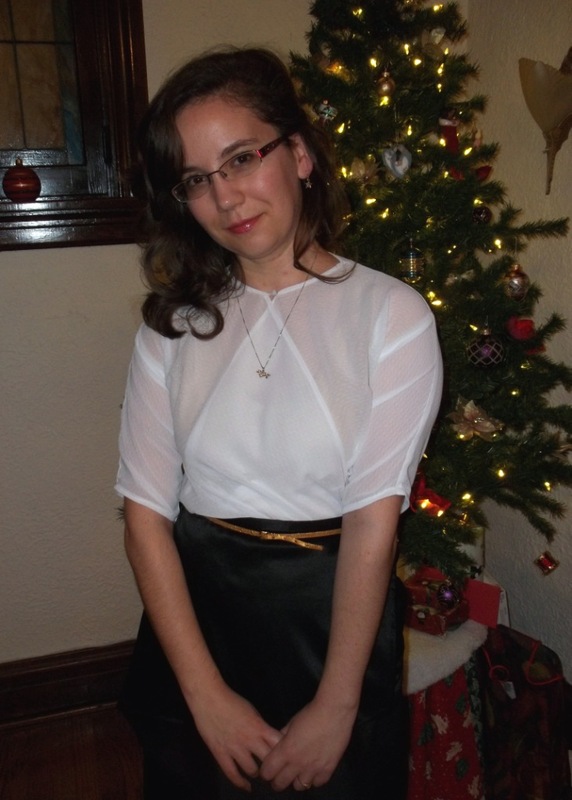 The sleeves of my blouse are elbow length (as you can see) merely because that’s all I had room for to cut out. Personally I wanted the long sleeves but I had no choice, and now I like the elbow length better because I think it keeps my blouse more all-season. Also, I sort of wish I had lengthened the back length and the side length by maybe a ½ inch or a full inch so the blouse isn’t so much a crop top, but again, this is no biggie, and I don’t like it any less. These points are just worthy of a mention so anyone else who makes this pattern can look out for what they too might like or dislike, and so I can remember, too, and change things accordingly “next time”. My big sole change to the pattern for the blouse had to do with the steps of construction. I added on the sleeves before I sewed up the side seams. 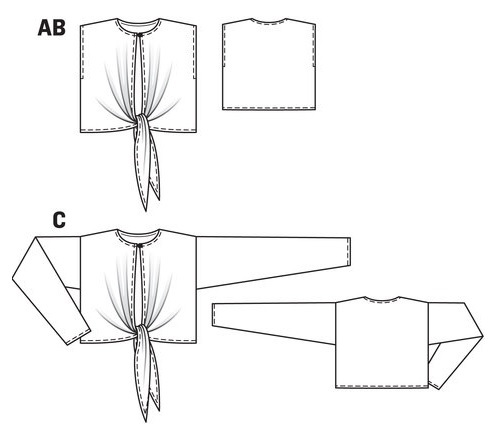 This way the side seams can be sewn in one continuous line from the sleeve end to the bottom hem. This was also not the best idea for a sharp angled corner as the pattern shows but I wanted a slightly more curved underarm seam so it worked out great for my preference. There was not enough chiffon leftover for me to make self-fabric bias facing like I would have liked, so I made do by using lightweight and supple stay tape as the edge facing. 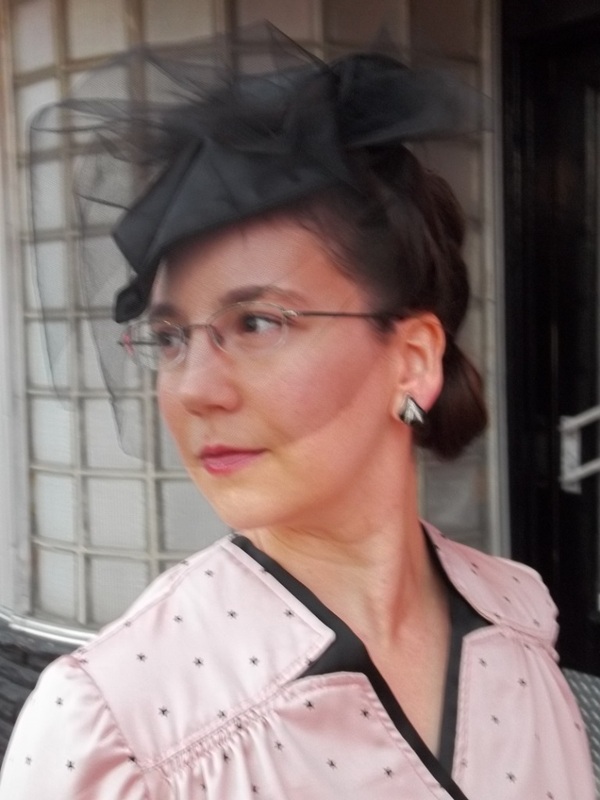 I took a small loop of tiny round elastic and tucked that into the neckline corner to close the button on the other side. 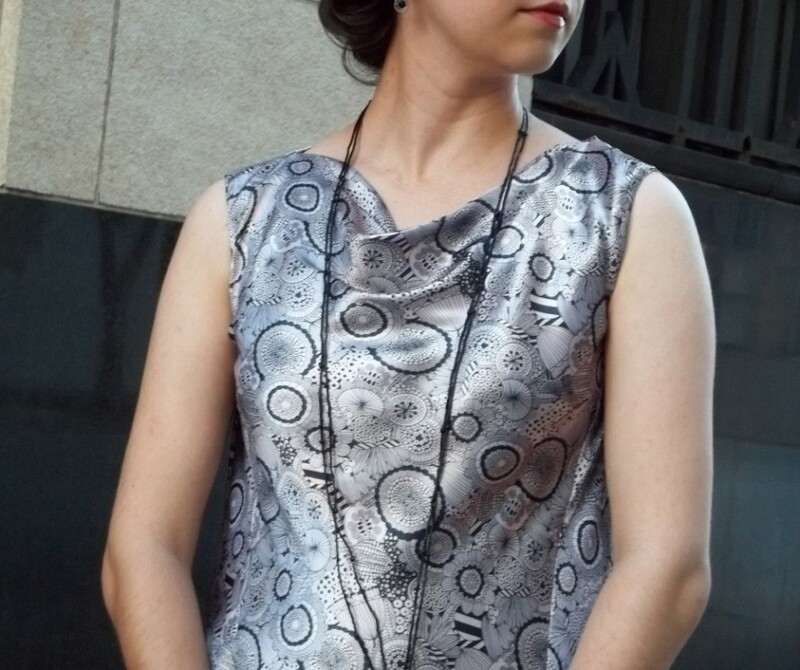 The ball button is a vintage shell item from my stash with a metal looped bottom. 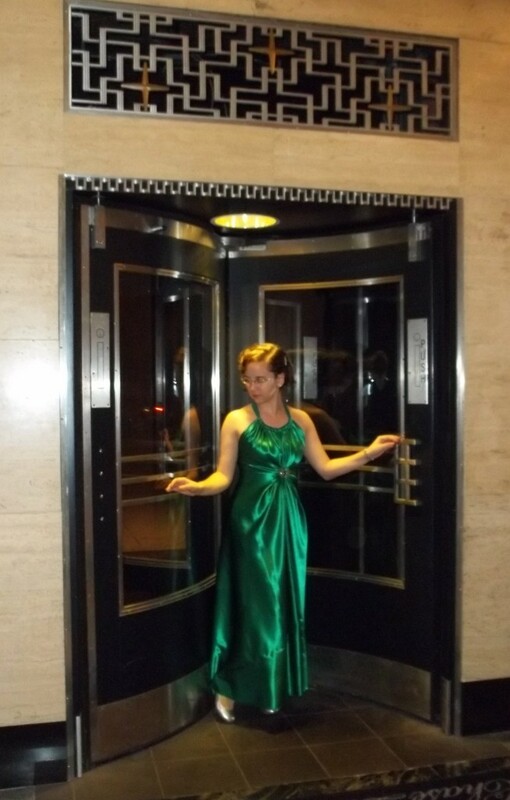 Both pieces harken back to several trends of several decades in the 19th century, the reason why this post is part of my “Retro Forward with Burda Style” series. 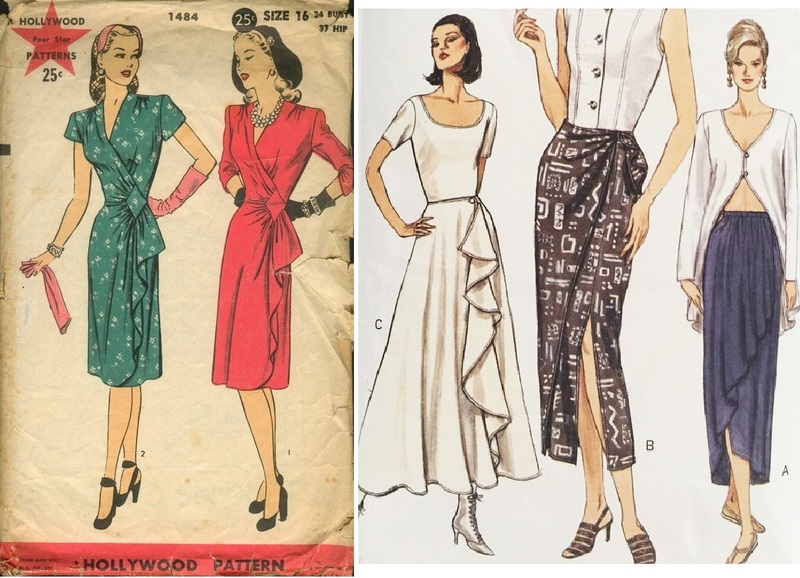 The draped front portion of the skirt calls to my mind the popular sarong styles of the mid-1940s, or the flowing ankle length dresses and bottoms of 1930 era, and the re-makes of these styles in the 1990’s (see below right). 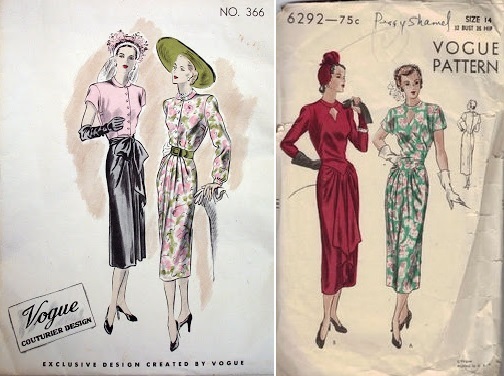 The front draping even reminds me of the post-World War II “Dior” era (see the two left pictures)– simple design, detailed appearance, elegant style but slimming silhouettes were the rule for such skirts. All these adjectives can apply to my Burda skirt too, I think. 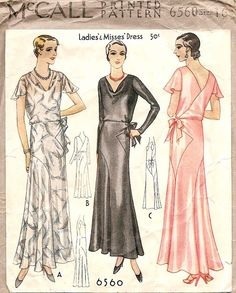 The tiny limiting hem circumference and gentle shaping slope of the hips first of all reminds me of the 1950’s “wiggle” dresses and skirt, but also the “hobble” looks of the early 1910 decade. 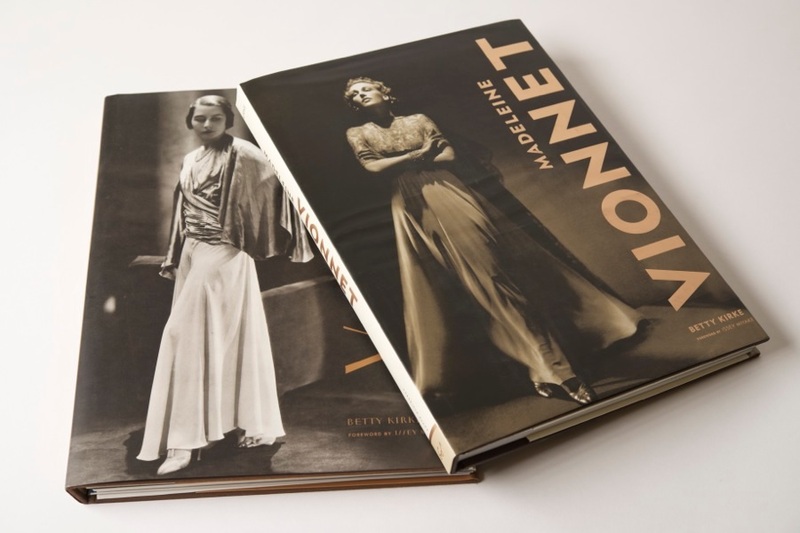 Both arose from a trend where it was considered the feminine silhouette to have a certain shape and restricted movement. This Burda skirt is like a modern interpretation of this, not as restrictive as the trends in the past…more like a 1980’s suit bottom – slimming, complimentary, with a touch of constraint. 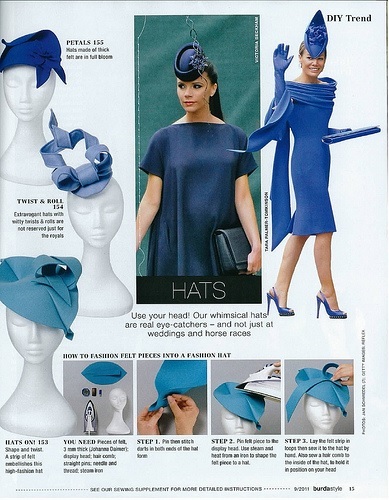 Burda itself has a plus size pattern option which is similar to the draped front skirt. 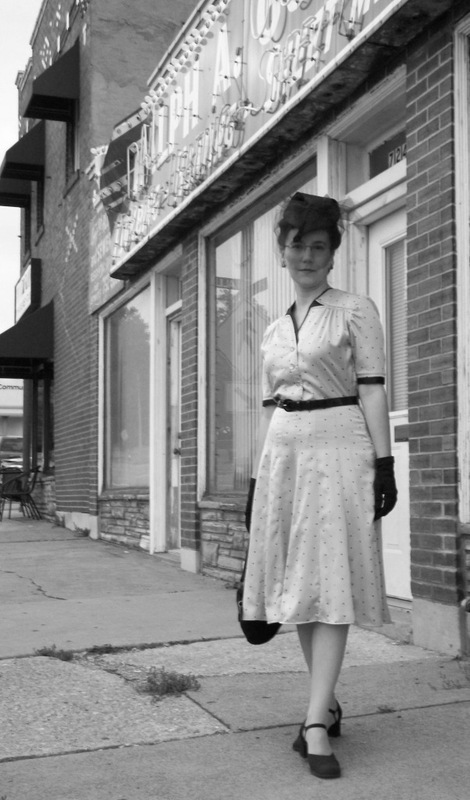 For the blouse, tie front or wrap-style are synonymous with the 1950’s younger “rockabilly” styles, but the 1940’s, 1930’s, and even other decades had these designs as well. 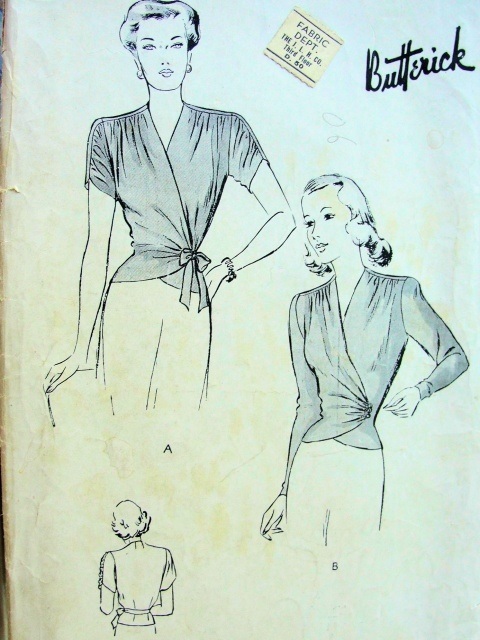 These kind of ‘minimal-closure-wrap-and-tie’ blouses are simple in shape and versatile making them perfect for the two eras of the 40’s and 30’s where women scrimped and saved and “made-do” on little supplies, yet managed to look glamorous and have new garments. 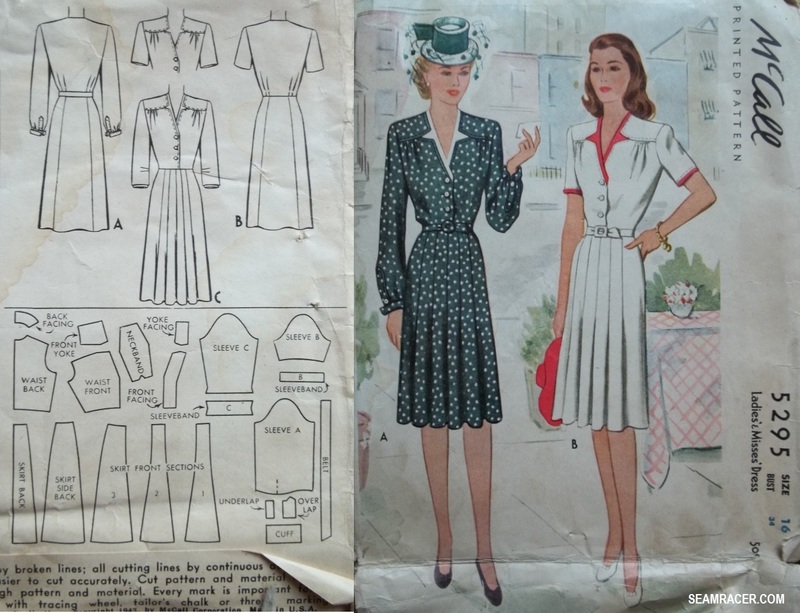 Many of these 30’s and 40’s “draft your own blouse” patterns were even freely published in magazines or articles (see “Vintage Pattern Files” for some of these) as a quick and simple solution to the perennial question of, “What will I wear?” Visit “Laura After Midnight” blog post here for a wonderful 1950’s era easy draft wrap/tie blouse and skirt. Here’s a toast to a past year of projects “in the can” and a new year of more creativity and adventures ahead! Happy sewing and happy New Year everyone!